After a long 13 day wait not knowing what might happen, the app finally went into review yesterday. Every hour was a tortuous wait filled with tension, coffee and more tension. The previous game had been approved in what seemed like record breaking time so as hour after hour went by we were sure something must be up. We imagined all types of scenarios going on behind the secretive doors of the App Review team: buzzers sounding, people running, foreheads sweating. Thankfully just as bedtime approached, a message came through letting us know that it had been approved! And what a beautiful message that was! 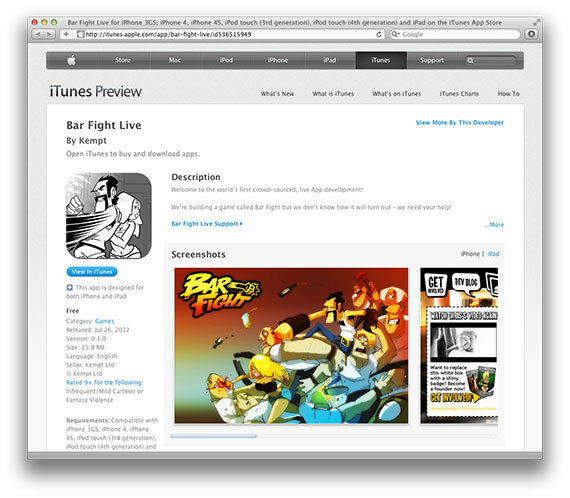 And here it is - Bar Fight Live in all it's App Store glory. Doesn't it look at home?